Summer in Narita – This was the fest's opening film and I was glad it had an encore screening during the closing weekend. Filmed in 1966, Shinsuke Ogawa embeds himself with the farmers and students protesting the building of Tokyo's Narita International Airport. It's in black and white and the humanistic sytle reminded me of Kurosawa's films, like Seven Samurai or Yojimbo, which were recently screened in Bangkok as part of the Japanese Film Festival's Akira Kurosawa Centenary Retrospective. But I also couldn't help but think about Thailand's red-shirt protesters, who style themselves as peasants (even if their leaders are wealthy) and adopted some of the same tactics as the Narita farmers. Sona: The Other Myself – Yang Yonghi's film offers a rare glimpse at life in North Korea, thanks to relatives living there who have a young niece named Sona, whom Yang sees as a sort of alternate universe version of her. Through family videos and photos, the film covers the little girl's growing from a toddler to a bright teenager. It also includes those jaw-dropping displays of North Korean patriotism – the flag-waving stadium pageants and stage productions extolling the virtues of the Great Leader and the Dear Leader. Narita: Peasants of the Second Fortress – Six years after Summer in Narita, Ogawa is still embedded with the peasant farmers, who are still protesting the airport, and even more determined to hold on to their land. This 1971 Narita film has more action, as the camera gets in the thick of skirmishes between the peasants and the riot police, and is up close and personal with women who chain themselves to trees. It's muddier, nastier and cold. The camera also goes underground, for an extended visit in one of the many tunnels dug by the peasants, where the aimed to live and not be moved. Again, I was reminded of Thailand's red shirts, and how easily the Thai military's tanks and armored cars rolled through the bamboo barricades and piles of burning tires. In Second Fortress, the barbed-wire barricades and chained-up protesters are removed by force and the tunnels wiped away by heavy earth-moving machinery. All in the name of progress. Next time I transit through Japan, I'll have a different outlook as I survey the ground from my comfortable airline seat and rush through the departure lounges to make my connecting flight. 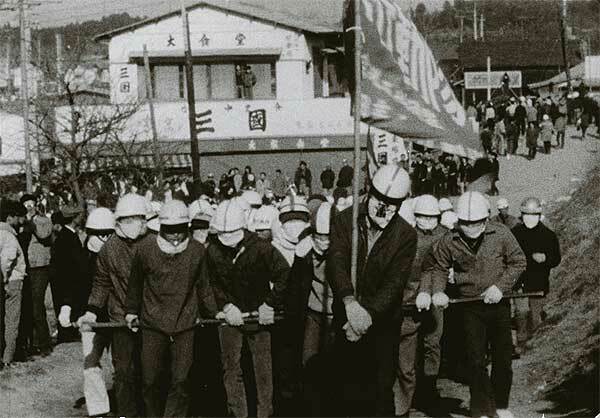 New Castle – Guo Hengqi's documentary reminded me a lot of one of my favorite films, John Sayle's Matewan, about the "Bloody Mingo" labor battle between union coal miners and the company gun thugs. "It were 19 and 20," intoned the narrator, who goes on to relate that "these were hand-loading days." Only this isn't 19 and 20. This is 2007, but Chinese coal miners are still using 1920s technology, loading coal by hand and dying and being maimed in their holes. There's also a look at the local farmers and their ways of life, herding goats and growing produce. The miners sit around and gripe about their conditions, until they are reminded that they are working, which is what they wanted. And that's a reality vividly brought to light when the mine is closed in a clean-air initiative ahead of the 2008 Beijing Olympics. Further, all the traditional old villages and homes are to be demolished, and everyone is forced to move into a new Western-style housing project, little boxes, one on top of another. It's a bleak, self-defeating existence that I can't imagine benefits anyone except maybe the companies that built these apartments. Hope Dies Last in War – Supriyo Sen takes a look at Indian families of air force pilots shot down during the Indo-Pakistani War of 1971. The spouses and children believe their husbands and fathers are still being held as prisoners of war. They hold regular protests to call attention to their plight. To underline their belief, at the beginning of the film there's a repatriation of Pakistani soldiers held in India since that conflict. It's a heart-rending argument, what with the wife, who recalls fondly the year and half she spend with her pilot husband, in her youth. Or of the now-adult son of another pilot believed to still be held. Yet neither side will admit to anything about the missing men. Disorder – Huang Weikai compiles footage shot by various amateur cameramen to paint a damning portrait of the new urban China, where cities are populated by people who clearly have no clue and authorities who are ever-so-frustrated to keep order. It's a sort of Cops: In China, with the camera showing up with policemen, firemen and ambulance crews as they respond to various bizarre disturbances, such as hogs on the highway, a mentally ill man dancing in traffic and another laying down in the street, who may or may not be faking being hit by a car. Also a poor dude who finds a roach in his bowl of noodles but is told by a matter-of-fact cop there's nothing they can do. So the guy is out a bowl of noodles. There's fires, floods and a disgruntled man in his boxers, ready to jump from a bridge unless he gets justice. In grainy black-and-white, Disorder is brutal, unflinching and pulsating with sad intensity, the type of which is like a bad train wreck you cannot look away from. Passion – The history of the cinema of Mongolia is covered in this portrait of Binder Jigjid, son of legendary Mongolian director Jigjid Dejid. Binder, while having had a taste of filmmaking under a grand, socialist-sponsored scale with his father and the once-giant Mongol Kino studio, has had to adapt to a new reality in Mongolia's market-driven economy. So he's making low-budget direct-to-video historical dramas and driving them from village to village, across deserts, steppes and the frozen tundra, organizing screenings in community centers and town halls as he goes. Director Byamba Sakhya, himself a part of Mongolia's new filmmaking reality, joins this elder cinema statesman on his journey. Lumpinee – The schoolhouse brawling, rubber-band-blowing novice Buddhist monk might raise eyebrows among Thailand's cultural authorities while the rest of the world might wring their hands in worry for the children – the children! – in this documentary by Chira Wichaisuthikul, which premiered at last year's International Documentary Film Festival Rotterdam and was supported by that fest's Jan Vrijman Fund. It's a Muay Thai movie. The title refers to the Bangkok boxing stadium that's a mecca for all the country's fighters, but most of the action takes place in a boxing camp in a village in Trang, in southern Thailand. There, the focus is mainly on the young boys who live at the camp and train to be boxers, throwing knee kicks, working the heavy bag, jumping rope and running, morning and night. On one hand, there will be child advocates who decry throwing the kids into this violent world where they are often exploited by their parents and unscrupulous trainers. On the other hand, Muay Thai gives the boys and girls structure in their life, teaches them discipline and makes them physically fit. For some children from poor families, Muay Thai is their only hope. And as the director said in the Q&A session after the film, the question is whether the violence kids are exposed to in boxing is any worse than the type action they see playing video games. There's a trailer for the film, and it's embedded below.